Battling with inner-city traffic to deliver parcels, post or food services can be a difficult task. It’s often not a case of keeping pace with traffic, but being able to nip through the smallest gap and find a parking space where others simply can’t compete. Add in low purchase and running costs and your choices are extremely limited, in many cases to a moped or a good set of boots. Enter (silently) Renault’s rather quirky Twizy Cargo, an LCV take on the French firm’s compact electric runabout. Looking like nothing else on the road, Twizy is just 2,338mm long and 1,396mm wide including door mirrors. That means that you can park sideways on in a standard parking space if required, with scissor doors allowing easy access. The Twizy car has two seats one beside the other. However for the Cargo model the rear seat has been removed and a lockable load area added, offering a surprisingly spacious 180 litre storage volume and a 75kg payload. Twizy is powered by a 6.1kW/h Lithium ion battery powering a 3CG asynchronous induction electric motor through a single speed transmission. With 57Nm of torque available from standstill the compact load lugger is quick to get away and can hold its own in urban traffic. It will even hit 50mph on the open road and feels surprisingly stable at full speed. It takes just 3.5 hours to charge from a standard three-pin 240V plug, with a connected lead stored in a flap on the front of the vehicle. Renault claims a full charge is good for up to 62 miles of range, though 50 is probably closer to the truth in normal use. Drive it in the winter months, as we did, and that drops with the temperature to the mid-30s. The system does have brake regeneration however and it is fairly effective, pushing your available range back up as you slow from higher speeds. The all-round disc brakes are a little less inspiring and require a reasonable shove to halt the Twizy rapidly. Though equipped with the optional scissor doors (£545), the Twizy Cargo does without side windows or a heater, making autumn an interesting time to get behind the wheel. It’s a fairly simple drive though, just push the brake, turn the key until the lights go green and then select D from the three push buttons to the left of the dash. The under-dash handbrake will only release once the ignition is on, so there are no worries of someone reaching in the open door and dropping the brake to let the Twizy roll when parked. There is a fair bit of electric motor whine and, despite the light weight, the suspension can crash a bit over larger bumps. But other than that it’s a remarkably civilised drive. 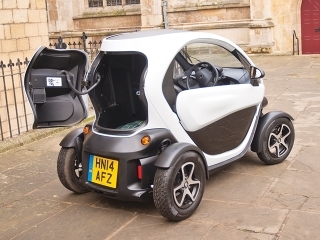 Twizy Cargo starts at £6,241.67, though as it is classed as a quadricycle there is no Government Plug-in-Grant available. Battery hire ranges from £30-75 a month, depending on duration and expected mileage. Battery hire includes a 24/7 breakdown service, even covering running out of charge. Twizy Cargo is as niche as you can get in the LCV market, but it offers a low cost urban delivery option and a sure fire way to get your company noticed.